Dropped some veggies on your silk saree at a party?… Don’t risk cleaning that soiled spot unless you know the right technique that’ll not ruin the fabric. Silk is a very delicate fabric, and therefore, needs to be treated with extreme care to avoid any damage. Any carelessness on this front can cause irreversible damage to the fabric. If you have dropped something on a silk item and wash only the soiled portion, that portion will appear faded immediately. One should never put silk items in the dryer. Instead wrap a towel around the silk clothing to soak the excess water. Set the iron at ‘low’ temperature or a setting specifically for ‘Silk’ to keep the fabric from burning. If you are using a washing machine to clean your silk clothes, always use cold water. 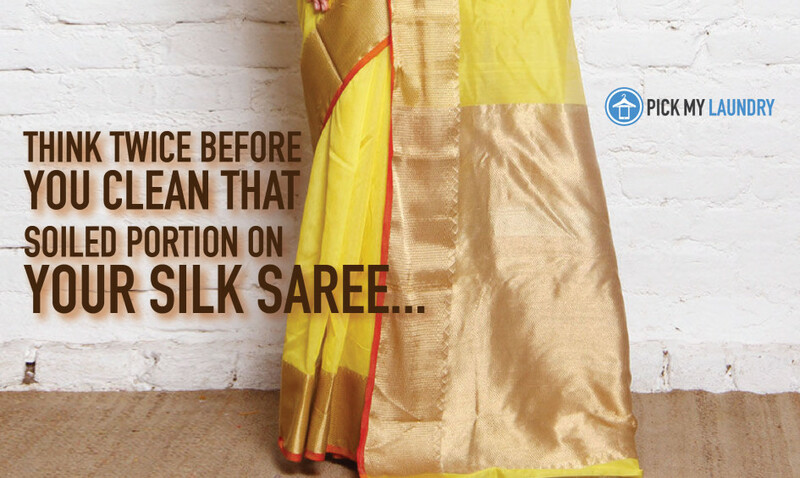 Keep these tips in mind to keep your soiled saree as good as new!